A major goal for X-ray free-electron laser (XFEL) based science is to elucidate structures of biological molecules without the need for crystals. Filament systems may provide some of the first single macromolecular structures elucidated by XFEL radiation, since they contain one-dimensional translational symmetry and thereby occupy the diffraction intensity region between the extremes of crystals and single molecules. Here, we demonstrate flow alignment of as few as 100 filaments (Escherichia coli pili, F-actin, and amyloid fibrils), which when intersected by femtosecond X-ray pulses result in diffraction patterns similar to those obtained from classical fiber diffraction studies. We also determine that F-actin can be flow-aligned to a disorientation of approximately 5 degrees. 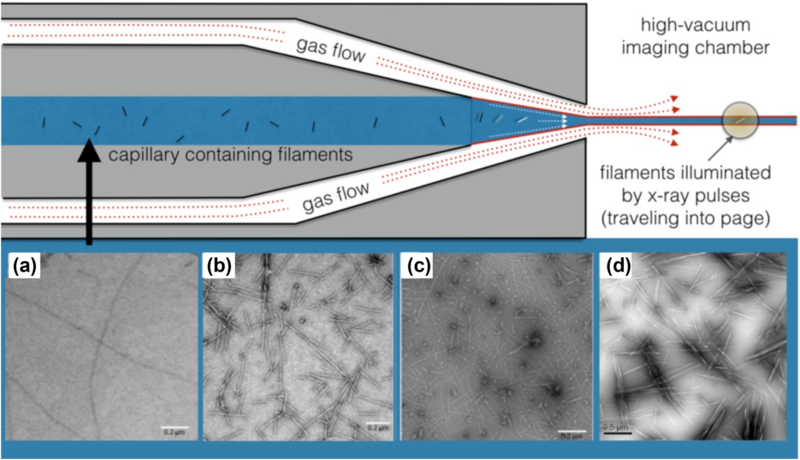 Using this XFEL-based technique, we determine that gelsolin amyloids are comprised of stacked β-strands running perpendicular to the filament axis, and that a range of order from fibrillar to crystalline is discernable for individual α-synuclein amyloids.